Junior Rachel Anderson (left) and Claudia Galio celebrate after Anderson hit a three-run home run in the fourth inning of a 9-7 win over Eastern Kentucky on April 1. 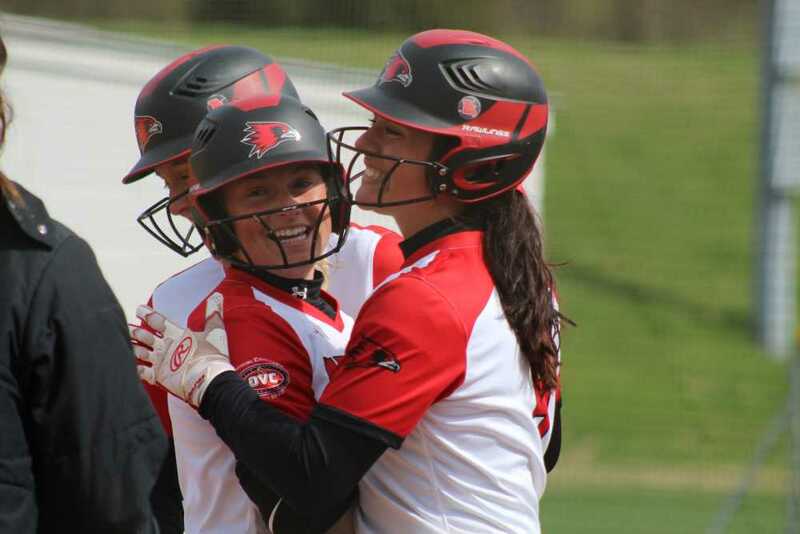 The Redhawks bats were red hot for their doubleheader on April 1 against Eastern Kentucky as Southeast swept the Colonels, winning the first game 4-1 and the second one 9-7 at the Southeast Softball Complex. The main catalyst for Southeast in both games was junior center fielder Rachel Anderson. The Colonels could not get Anderson out as she went 5-for-5 across the two games with two home runs, four RBIs, three walks, four runs and two stolen bases. The Redhawks cruised to a 4-1 win in the first game thanks to a complete-game pitching performance from senior Haley Thogmartin. She picked up the win, allowing only three hits, one unearned run, one walk and striking out 10. The second game was a back-and-forth affair, with each team swinging the composite solidly. Southeast got it started with two runs in the bottom of the first, courtesy of a two-run double by junior third baseman Addison Barnouski. Eastern Kentucky didn’t waste any time tying it up and taking the lead as it scored two in the top of the second and three in the top of the third off Redhawks junior starter Alexis Estes. Southeast came back to tie it at 5-5 in the bottom half of the third, scoring one run on an Eastern Kentucky error and two runs on a two-RBI double by sophomore Kaylee Anderson. The double was not Anderson’s only contribution for the Redhawks. She pulled double duty as she was called on to pitch in relief of Estes, throwing2 ⅓ innings of three-hit, one-run ball to pick up the win. Southeast sophomore Rachel Rook was also solid in relief, allowing one hit and one run with two walks and two strikeouts. The Redhawks took the lead for good in the bottom of the fourth on a three-run home run by Anderson it to 8-5. Southeast junior outfielder Claudia Gallo put the finishing touches on the game with a home run in the bottom of the sixth to give the Redhawks a 9-6 lead. Gallo went 3-for-3 at the dish with a home run, RBI and four runs scored. Gallo also flashed the leather, making a tough running catch deep in the left-centerfield gap. After the Colonels got runners on in the top of the seventh, Thogmartin was called on to get the final out of the game, picking up the save to close out the 9-7 Redhawks win. With the victories, Southeast improved to 27-8 overall and a 5-1 record in Ohio Valley Conference play. The Redhawks will be back in action at 1 and 3 p.m. Saturday, April 6, when they hit the road for an OVC doubleheader at SIU-Edwardsville.